Don't meddle with the metal. The world has a new hero, but he's short a penny. Stamped with a one-cent handicap, laughed at inside every purse or pocket he dropped into, Ned Nickel never believed he'd amount to much, not even a cheap cigar. But when fate places Ned rim to rim with a sagacious Indian nickel, the four-center learns that he has a most surprising destiny. Chief Iron Tail instructs Ned in the ways "wampum," and he soon discovers that his puny diameter contains a million bucks of fantastic. Teaming up with a luckless Lincoln wheat penny, the three coins sally forth to save Coinworld from a worthless future and become the champions of small change everywhere. A bigger story never came in a smaller package. 4Â¢ Ned is e pluribus awesome! The Amazing Adventures of 4Â¢ Ned is Book One in the Coinworld Series. *Extra deal! 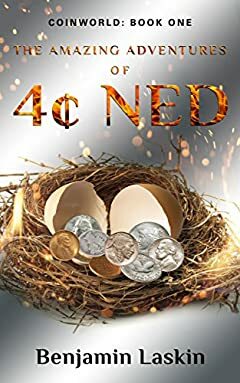 * If you act now, you can pick up books 2-7 in the 4Â¢ Ned Series for just 99Â¢ each, including the just-released Coinworld: Book 7. All together, that's seven good-time adventures in loose change for the price of two. Take advantage of this rare chance today and put some silvery, rolling fun in your winter reading.